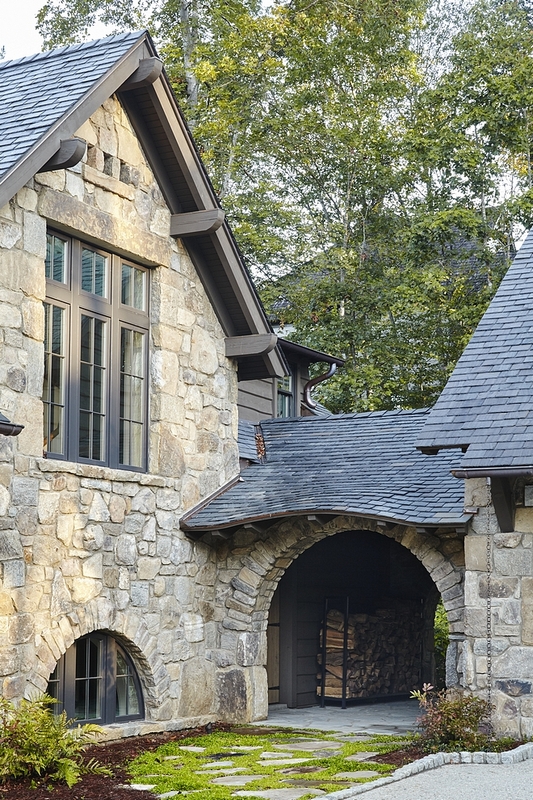 Located in The Reserve at Lake Keowee in upstate South Carolina, this lake house with stone exterior is beyond words! I honestly feel very proud to be sharing it with you today. 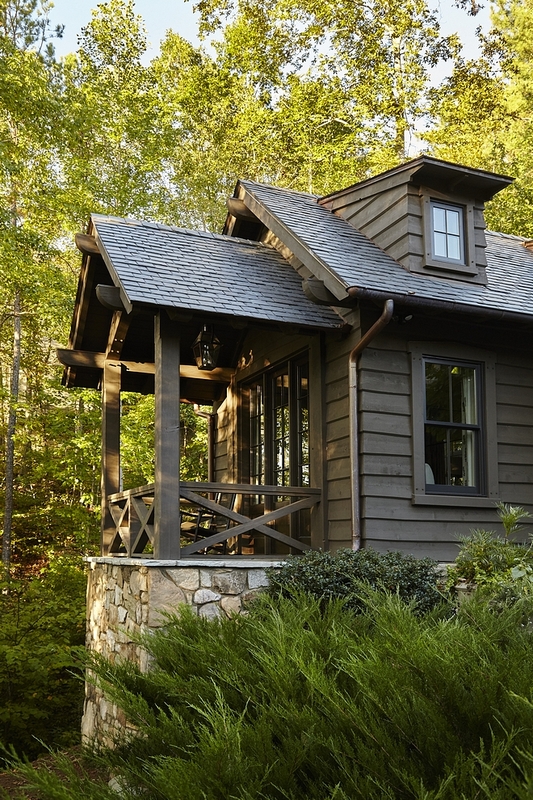 This vacation lake house was designed by Timothy S. Adams TS Adams Studio (Noah Speights was the project manager) and the impeccable interiors are by Barbara Westbrook of Westbrook Interiors. 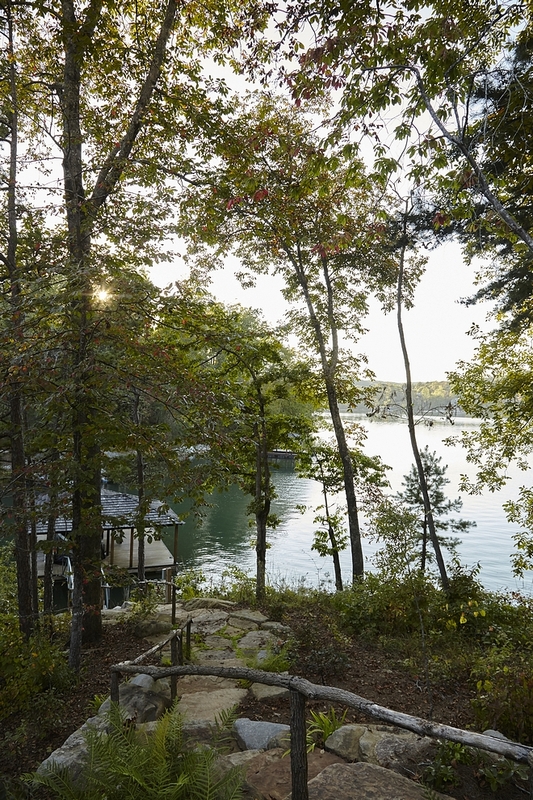 It took many years (eight, to be precise) for the homeowners to finally have their dream lakehouse, but the right moment certainly arrives to those that persist upon their dream. 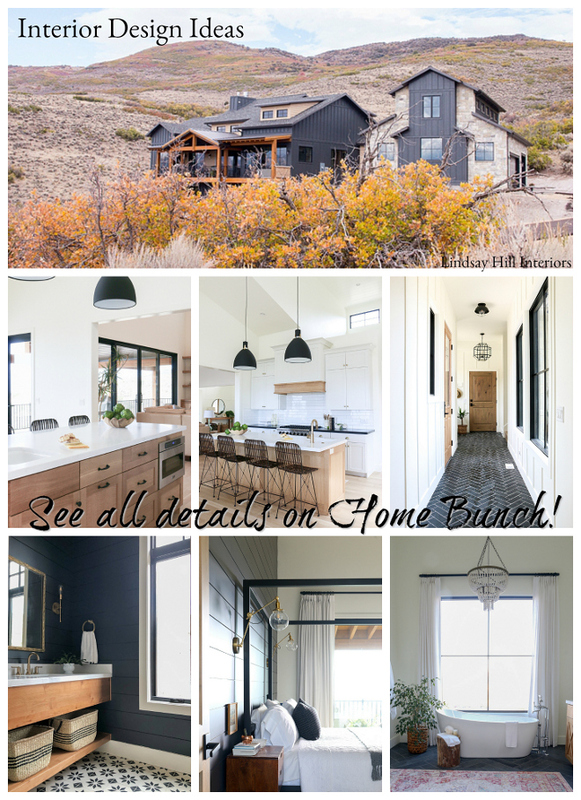 What I love most about this home is that nothing is predicable yet everything feels balanced and in harmony. You will notice that most of the furnishings are custom (available through the designer), but I will be sharing similar items to make it more accessible. Photography is by Emily Followill. 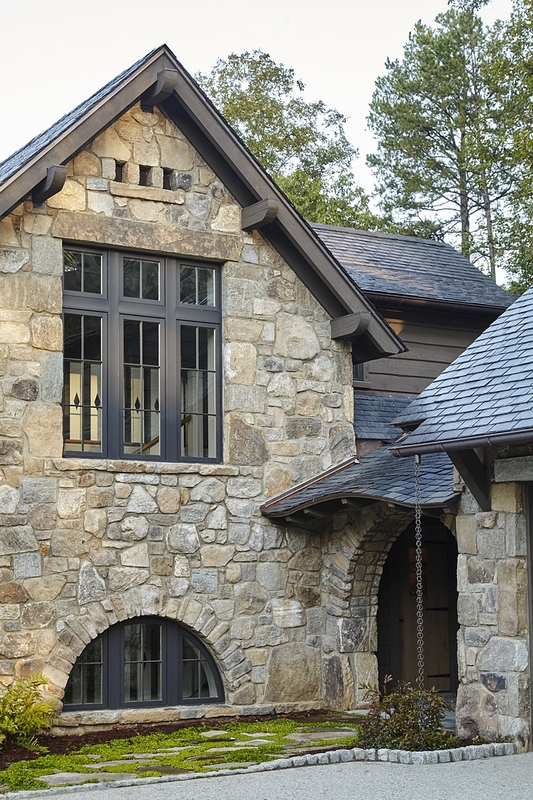 The exterior features windows with stone lintel and wood corbels. 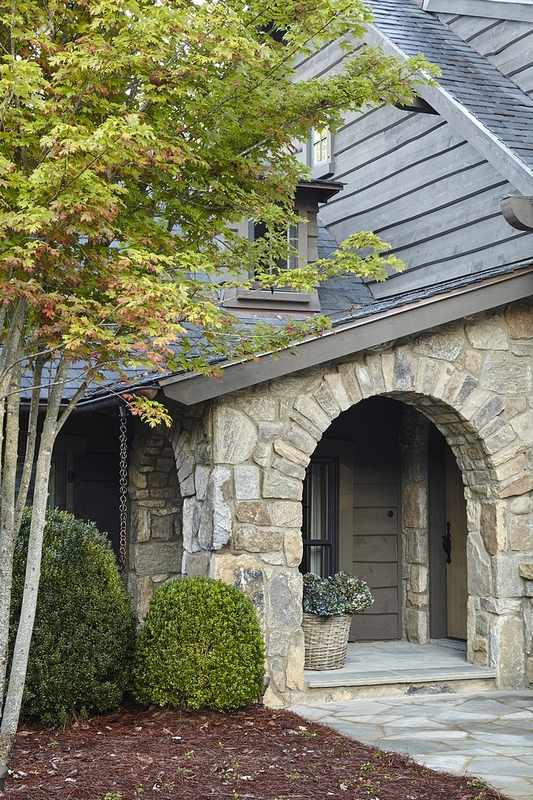 An arched breezeway between the garage and mudroom door adds character to this classic rustic lakeside home. Siding is undressed pine with mitered corners. 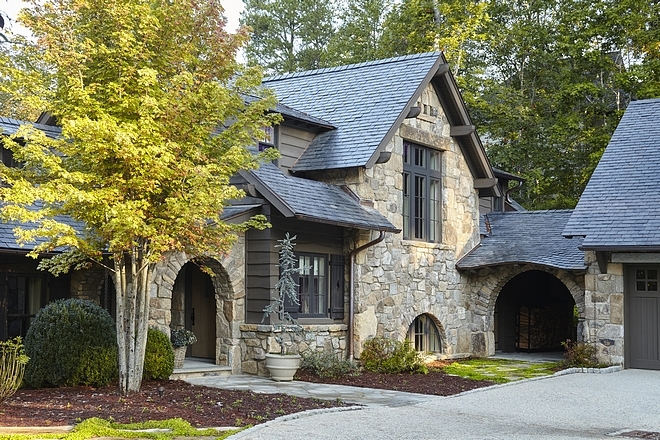 Similar Trim & Garage Doors Paint Color: Sherwin Williams Seal Skin SW 7675. 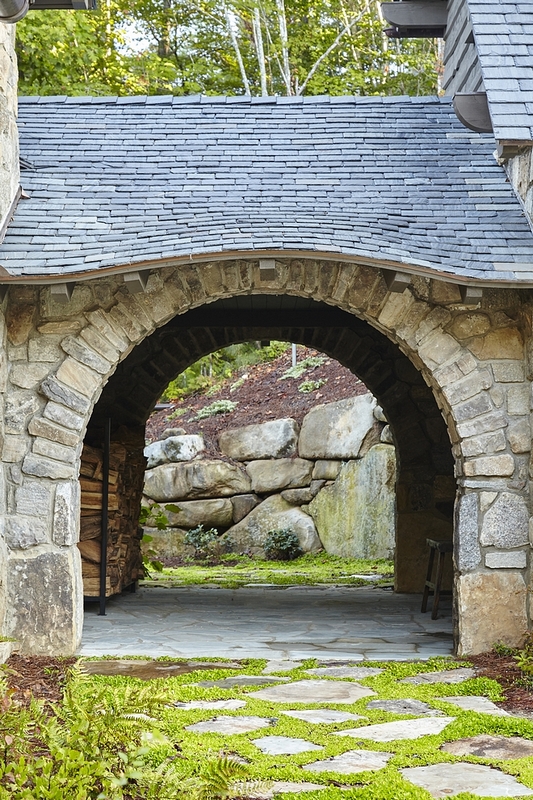 An enchanting arched door opens to an equally enchanting foyer with natural stone flooring and nickel joint walls. The wall color is Classic Gray Pratt and Lambert. 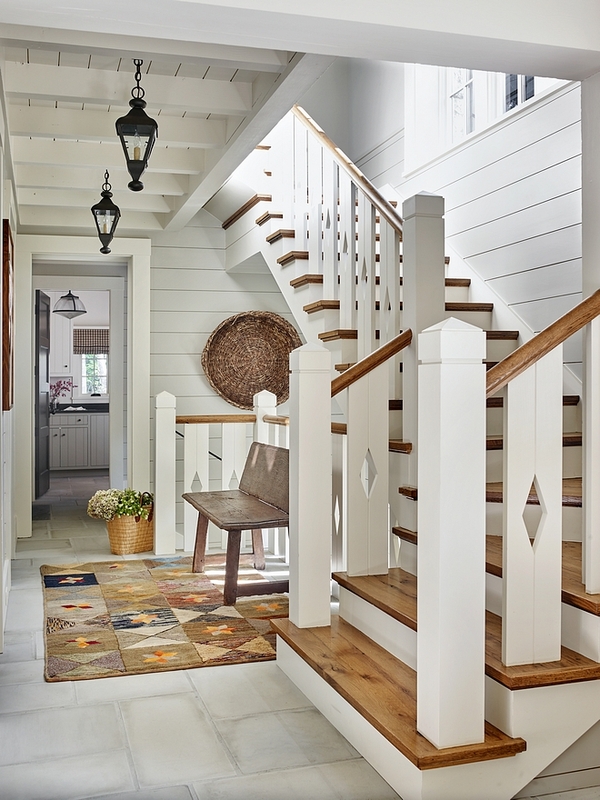 The staircase design was inspired on picket fences. 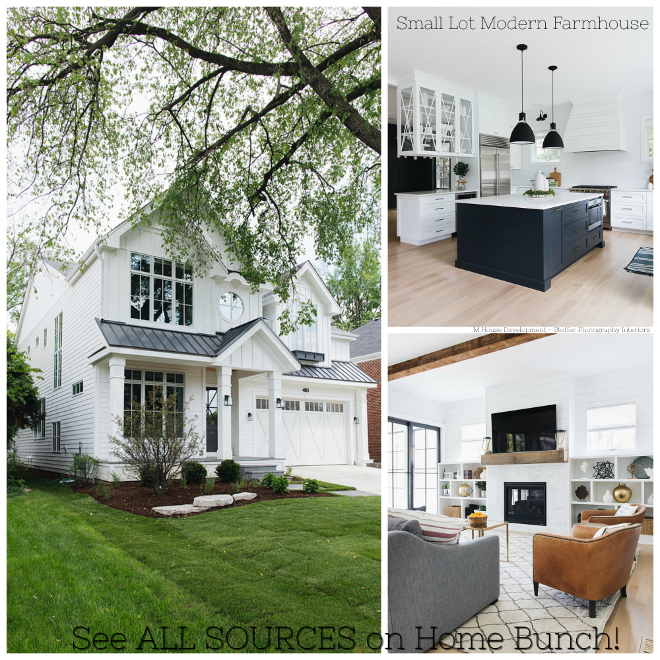 Lighting: Laura Lee Designs – similar: here, here & here – similar. 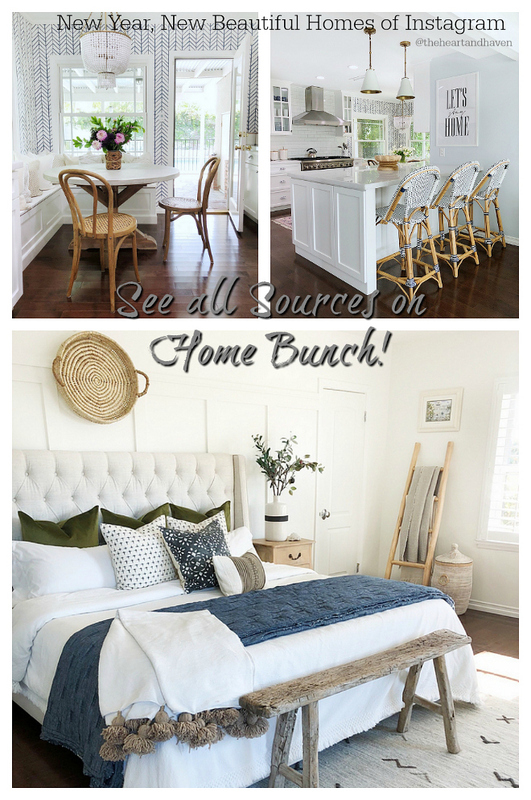 Bench: Vintage – Other Foyer Benches: here, here, here, here, here & here. Trim paint color throughout the house is Chalk Grey 11-32 Pratt and Lambert. All paint on board walls and trimwork is a Satin finish. This Great Room is one of the most impressive I have seen in a while. 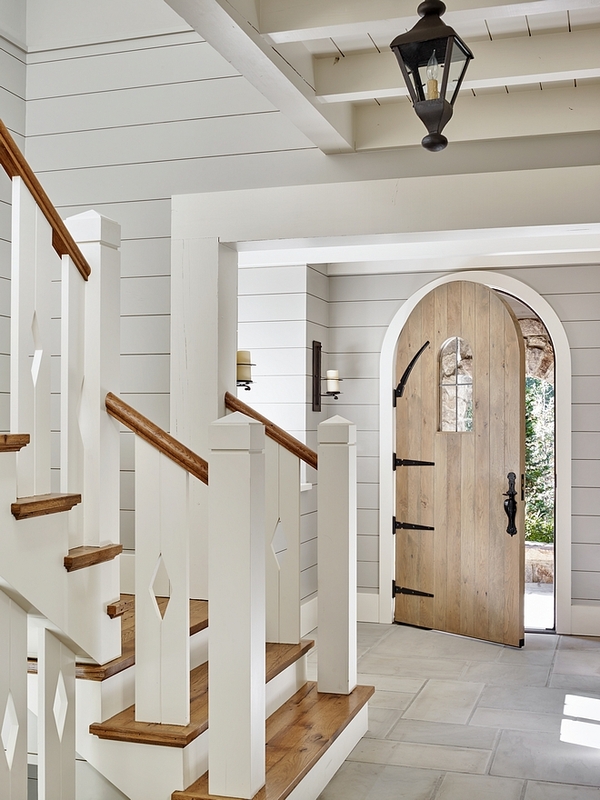 The decor works perfectly with the architectural details. 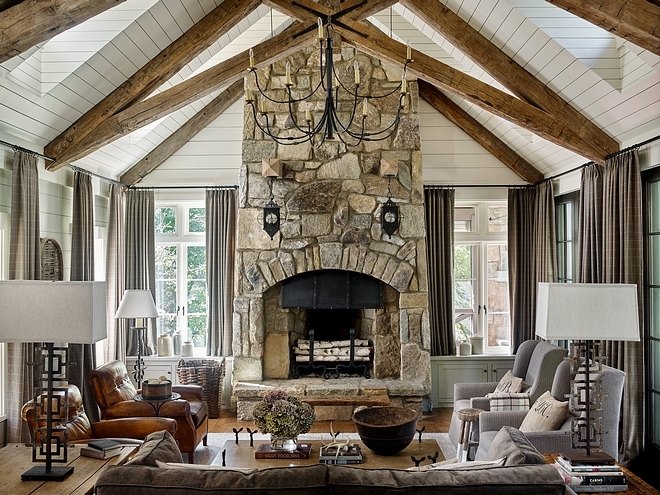 Notice the gorgeous stone fireplace and the ceiling featuring scissor Timber trusses. Ceiling also features dormers on both sides. The fireplace design was inspired by an image the architect saw many years back in an old Arts and Crafts book. Notice the two timbers projecting out of the fireplace where the sconces were hung. Chandelier: Bevolo – similar here, here, here (2 tier chandelier) & here. 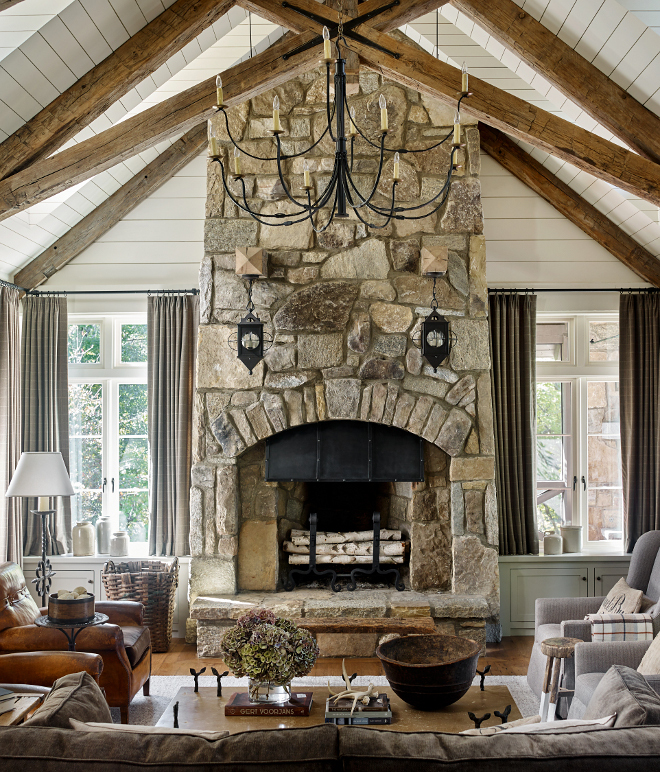 The lanterns on the fireplace are Paul Ferrante from Ainsworth Noah. The wall color in the Living Room is Classic Gray Pratt and Lambert. The sofas are from Bungalow Classic (similar here & here) and the stone coffee table is from Jerry Pair (similar here & here). Many of the antiques are from Foxglove, Nicholson Gallery and Provenance or Scott’s Antique Market. 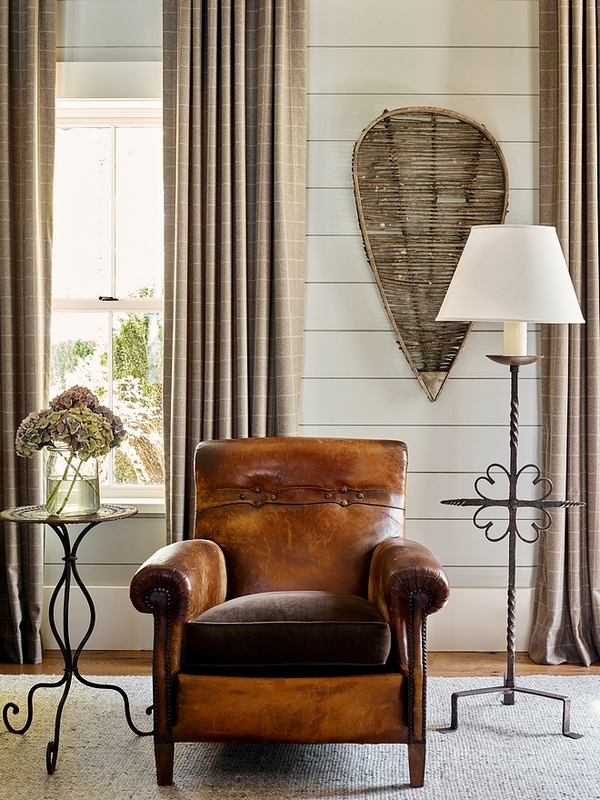 A pair of vintage leather chairs add warmth to the color scheme of this living room. 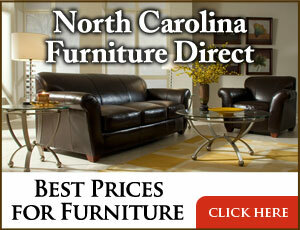 Beautiful Leather Chairs: here, here, here, here, here & here. Floor Lamp: here – similar. 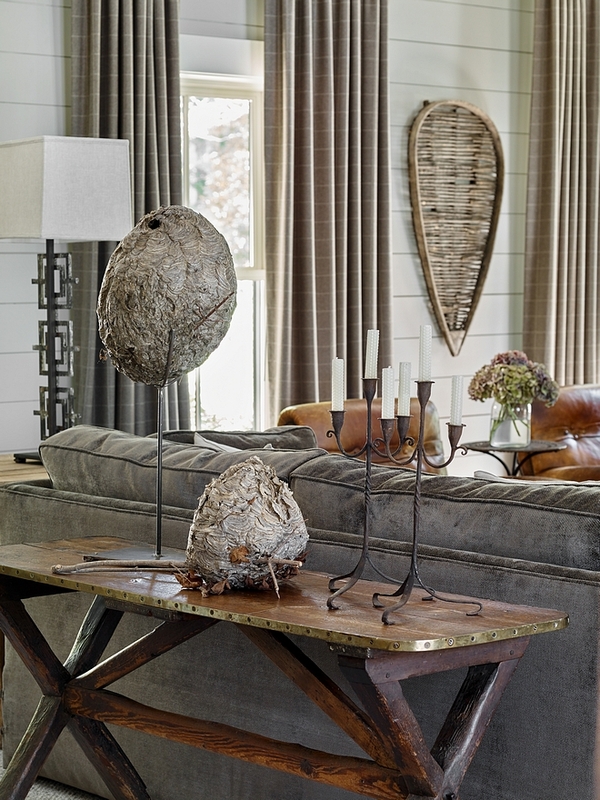 The talented interior designer, Barbara Westbrook, beautifully combined neutral tones to complement the natural surroundings. 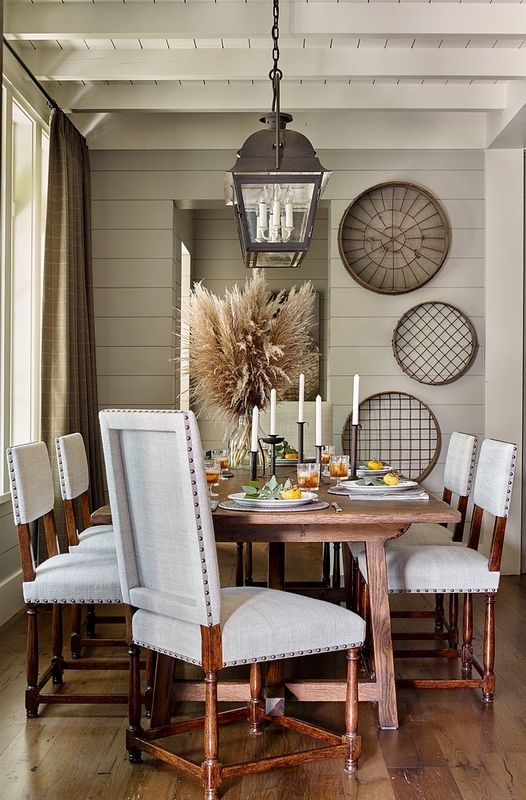 Featuring the same shiplap walls, this gorgeous dining room feels casual and elegant at the same time. 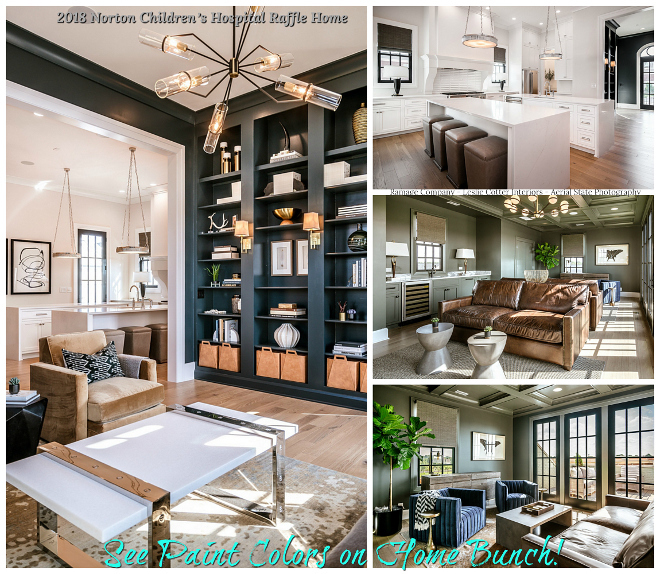 Paint color is Classic Gray Pratt and Lambert. 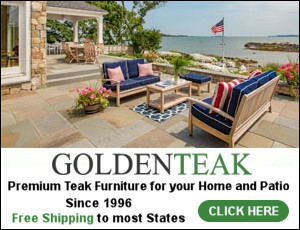 Dining Chairs: Jerry Pair – similar here, here, here, here, here, here & here. 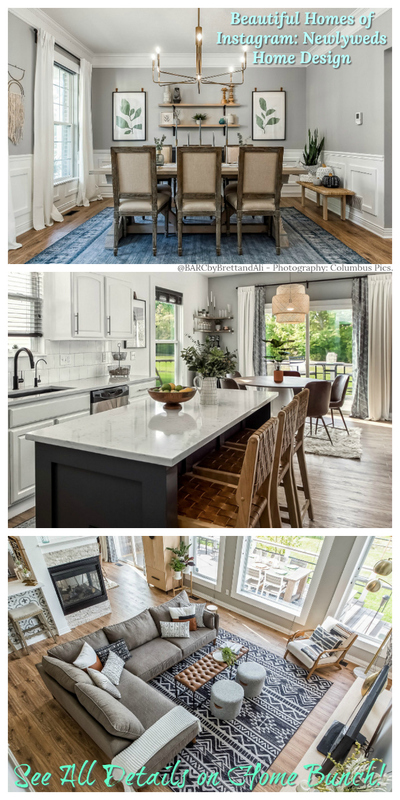 Dining Table: Custom – similar here, here & here. 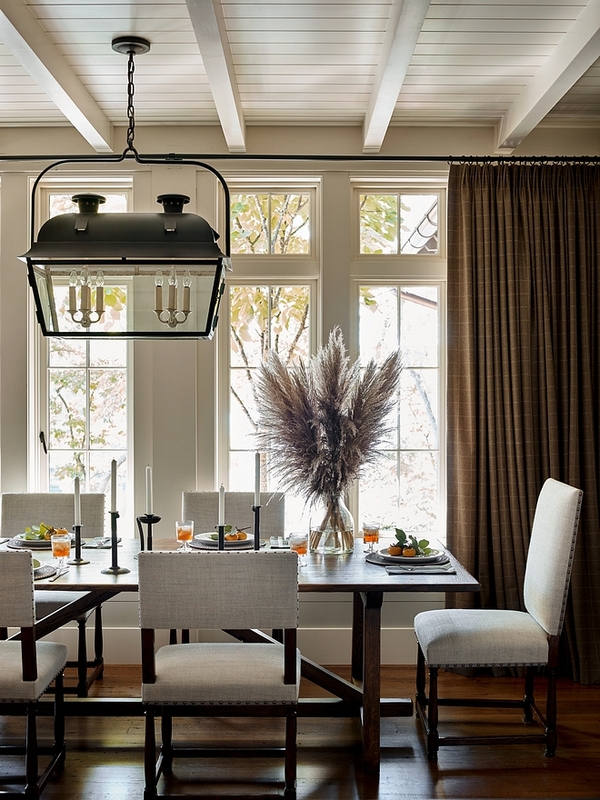 This stunning linear chandelier is the Paul Ferrante Double Lantern – similar here. Other Beautiful Linear Chandeliers: here, here, here, here, here, here, here, here, here, here, here & here. Now, this is a kitchen!!! 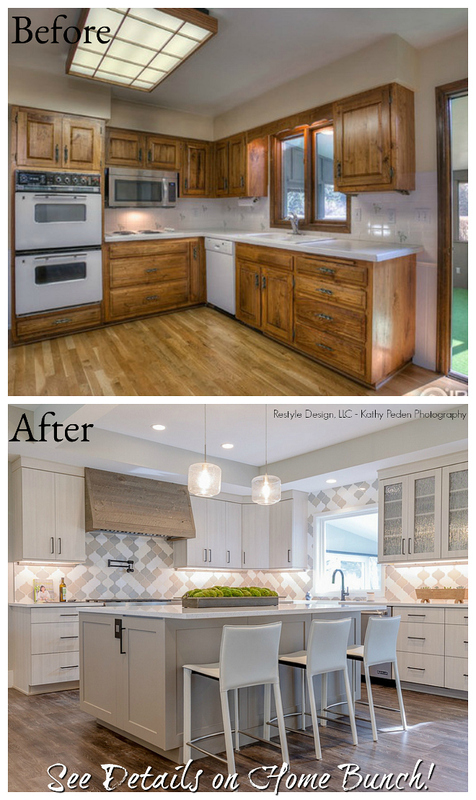 Pay close attention to the details… Notice the side cabinets framing the kitchen hood area and that stunning – yet neutral – backsplash tile. 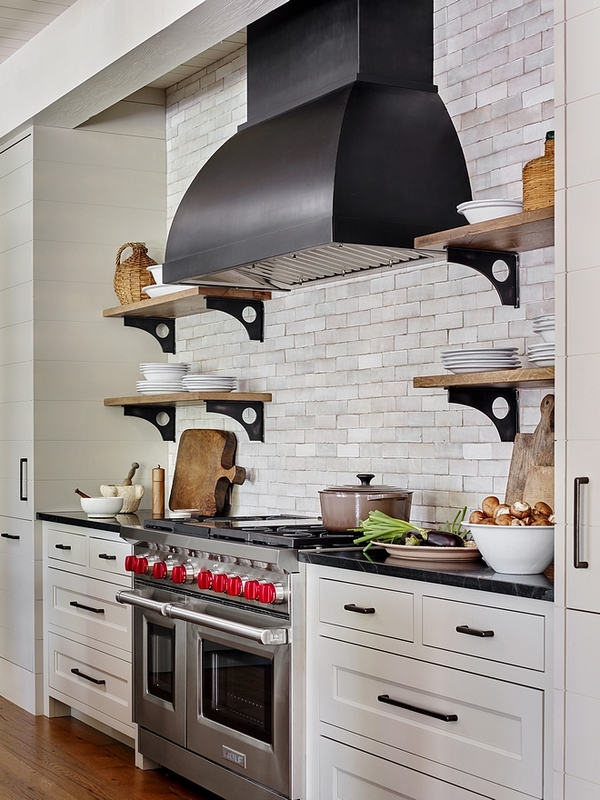 The kitchen hood is a custom iron hood vent. Similar Kitchen Hood: here & here. 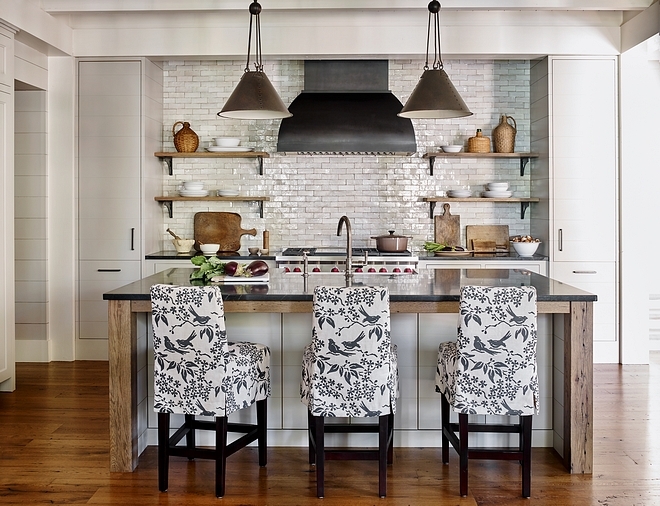 Counterstools: custom, available through the designer – similar here. 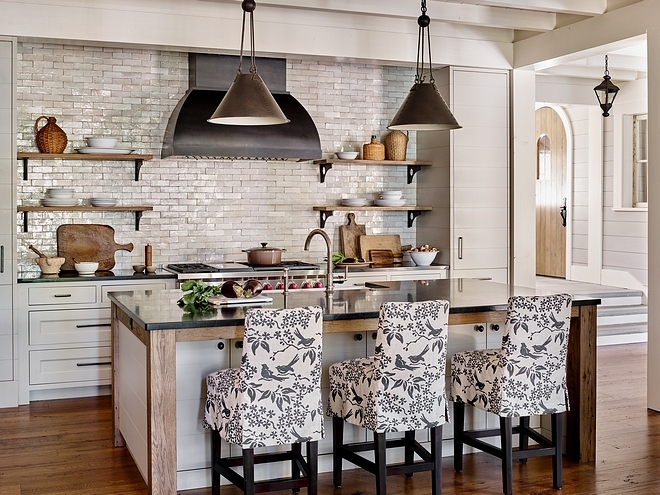 Pair of shaded pendant lights from Paul Ferrante – Similar here, here, here & here. Hardwood Flooring: The floors are character grade oak in random widths of 5”, 6” and 7” – similar here & here. 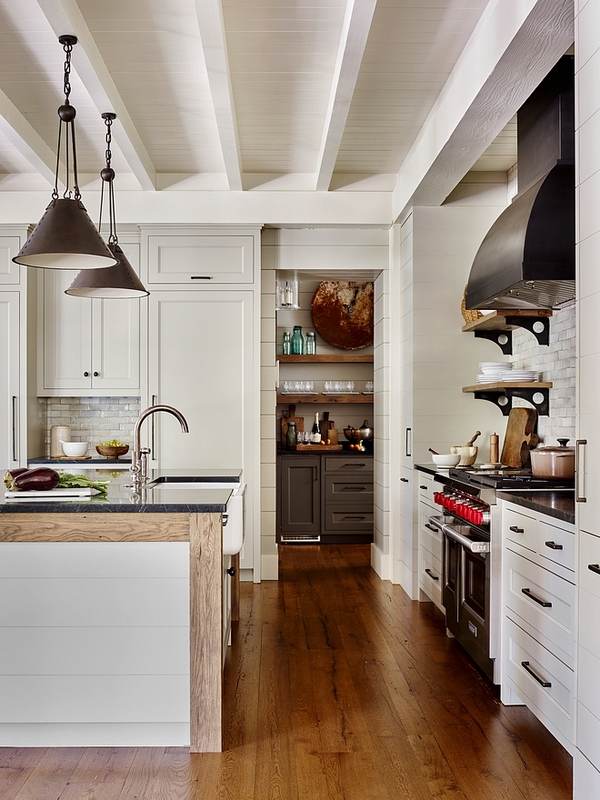 Kitchen island is Timber framed with shiplap sides and doors in front of the island (under countertop). 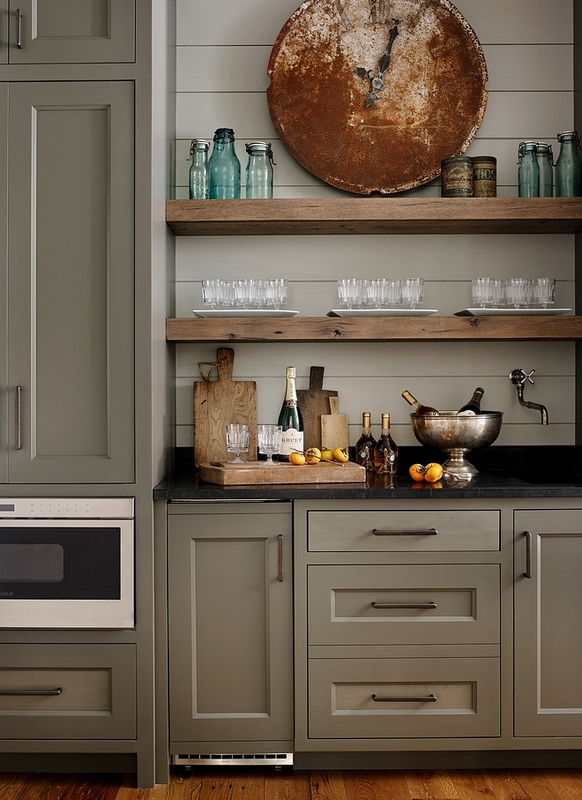 Countertops in the kitchen are Marianna Soapstone from Walker Zanger. Shelves: custom – similar here. 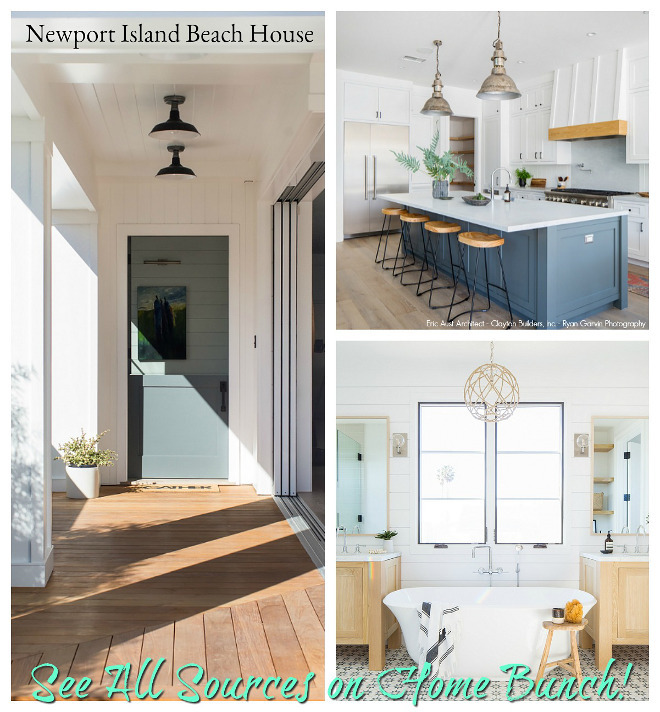 Kitchen Hardware: here – similar. 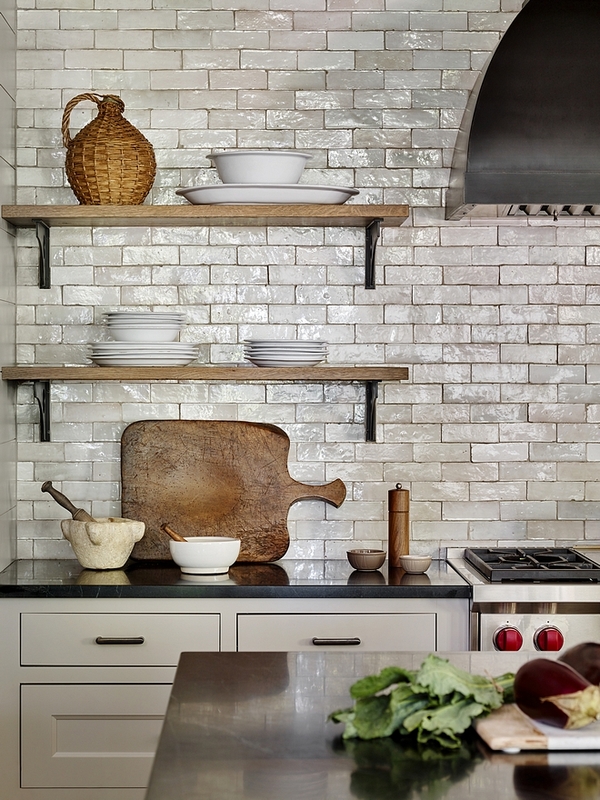 Kitchen backsplash is a Mosh Tile from Renaissance Tile in Atlanta and is a 2” x 6” – similar here. Kitchen Cabinet Details: Painted maple wood, Shaker style. Kitchen Faucet: Waterworks Henry Faucet – similar here & here. The bar/ pantry cabinet color is Durango 33-24 Pratt and Lambert. 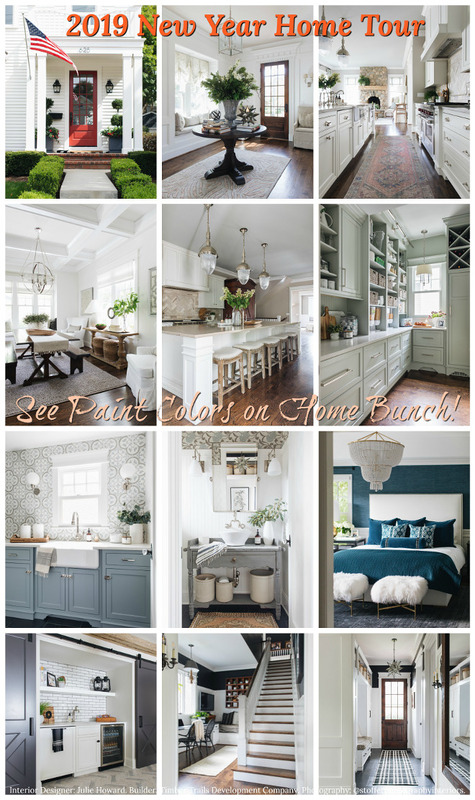 Kitchen Cabinet Paint Color: Classic Gray Pratt and Lambert. 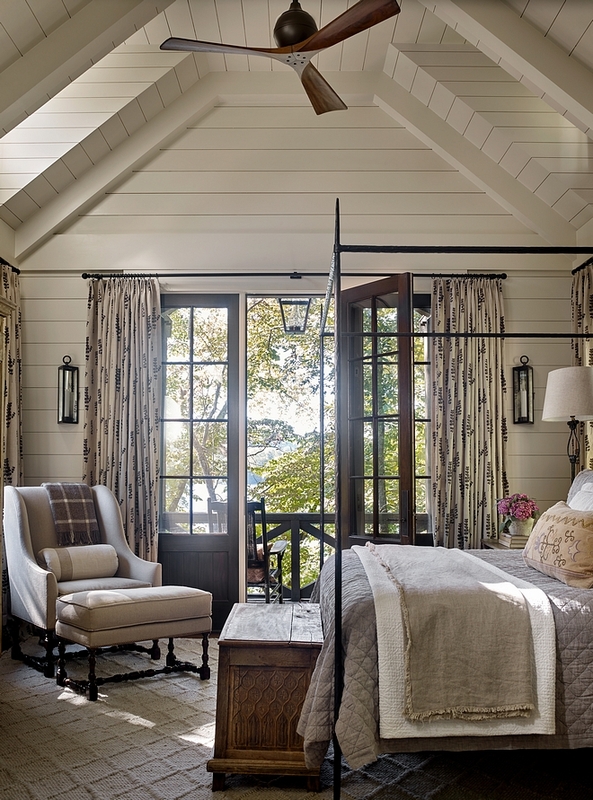 What a stunning master bedroom. This room has a private balcony with lake view. I have always being a fan of four poster canopy beds and this wrought iron bed is beyond words! The bed is by Kerry Joyce. The bathroom cabinetry is a custom stain on oak. The vanity is 8′-8″ Wide. The recessed medicine cabinets are custom. 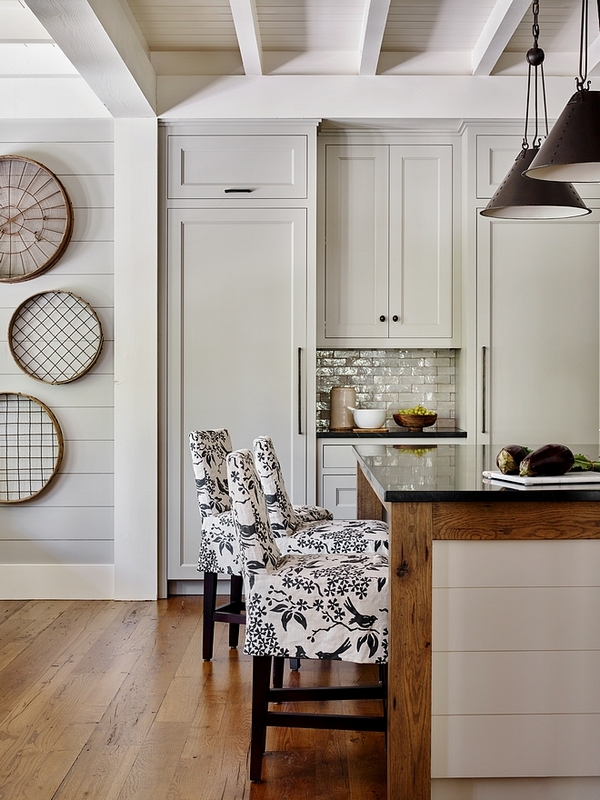 The designer combined an interior window with custom medicine cabinets to create this look. The wall color is Classic Gray by Pratt and Lambert. 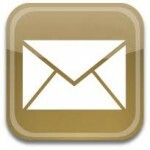 Faucets: Waterworks – similar: here. Light fixtures in the Master Bath are from Radio Guy. I absolutely love bathrooms with hardwood flooring. 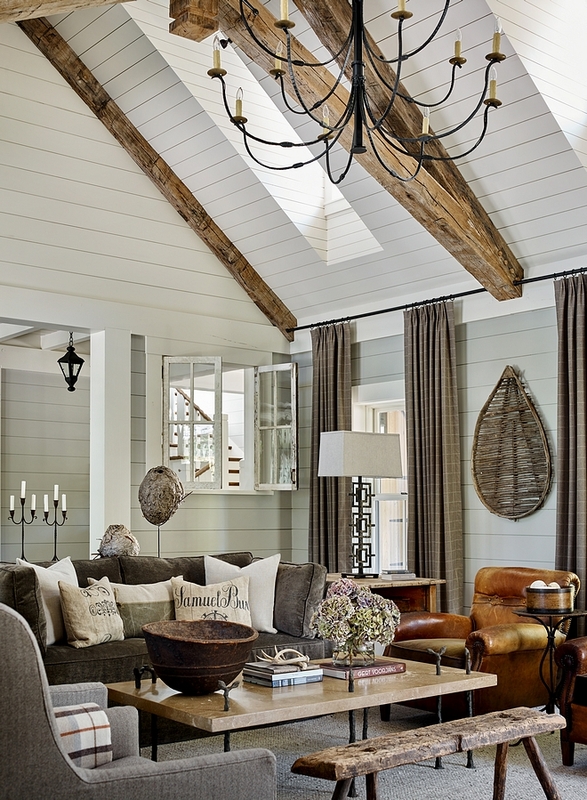 Add shiplap and custom drapery and you have a winner! Freestanding Tub: Waterworks – similar here, here, here & here. 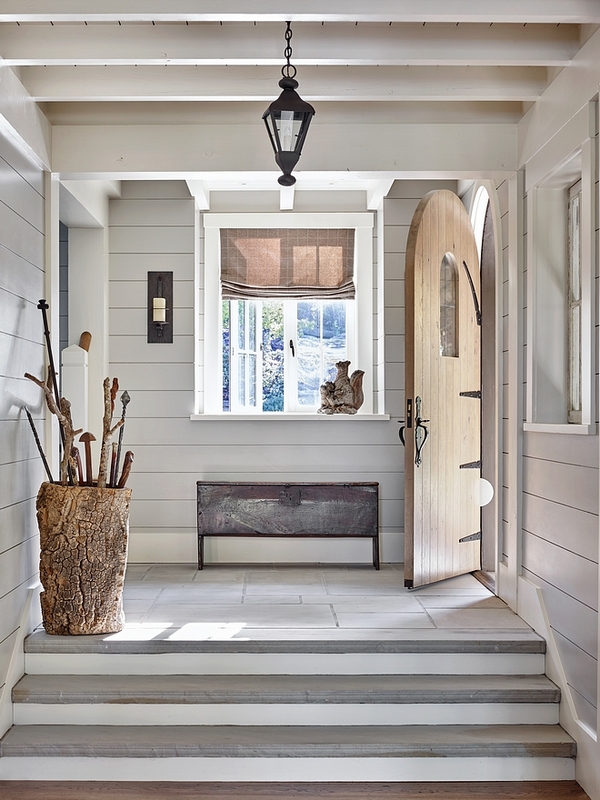 The mudroom features a custom wooden door and Bluestone pavers. Notice the White Oak cabinetry on the right. Light is from South of Market – similar here & here. 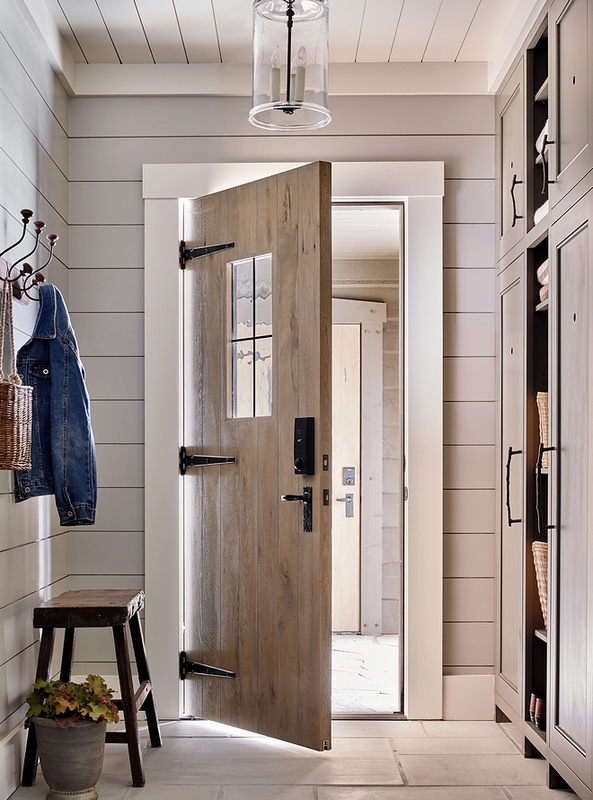 Cabinet Pulls: Rocky Mountain – similar here. Beautiful Hooks: here & here. Exterior lights are from Bevolo – similar here, here & here. 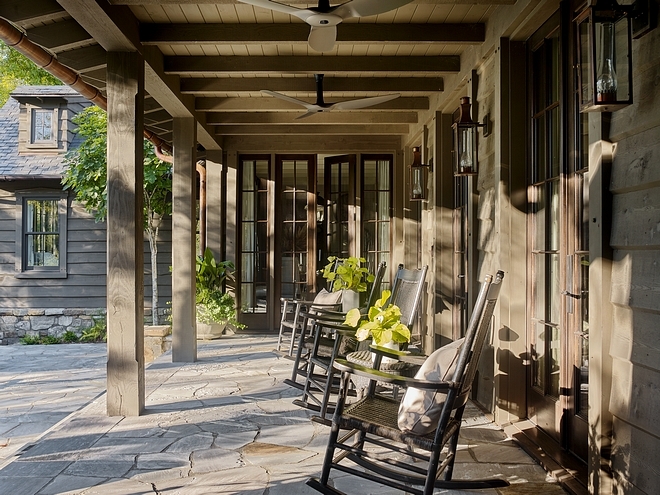 Rocking Chairs: here – similar. 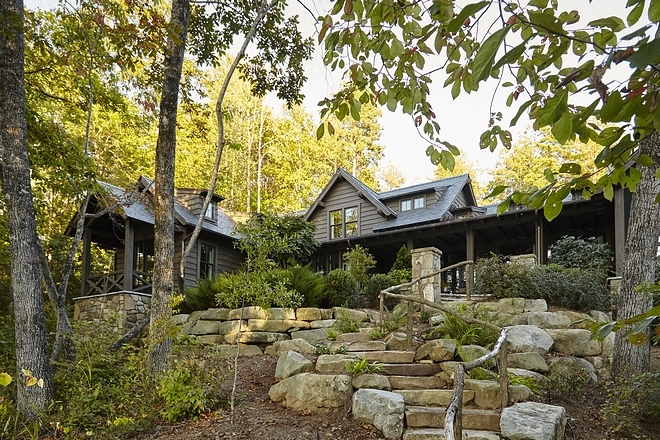 I love how private and peaceful this home feels. The master bedroom’s balcony is quite and inviting. 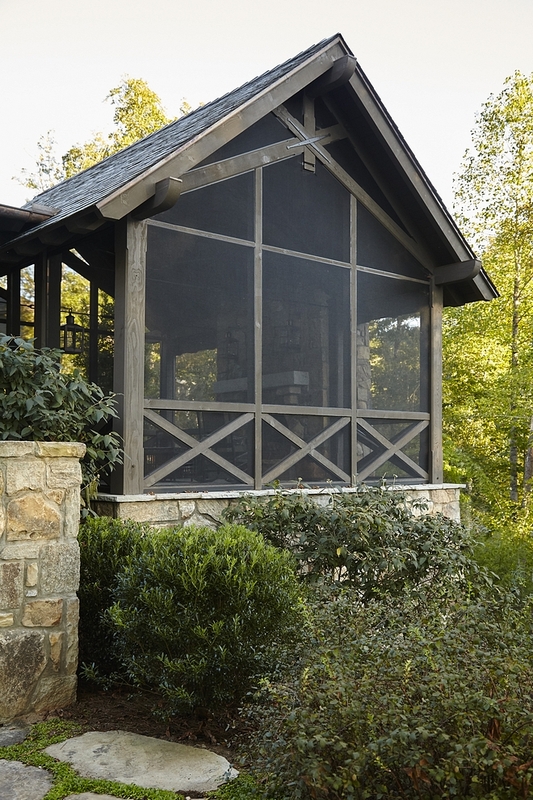 The screened-in porch features a stone fireplace. 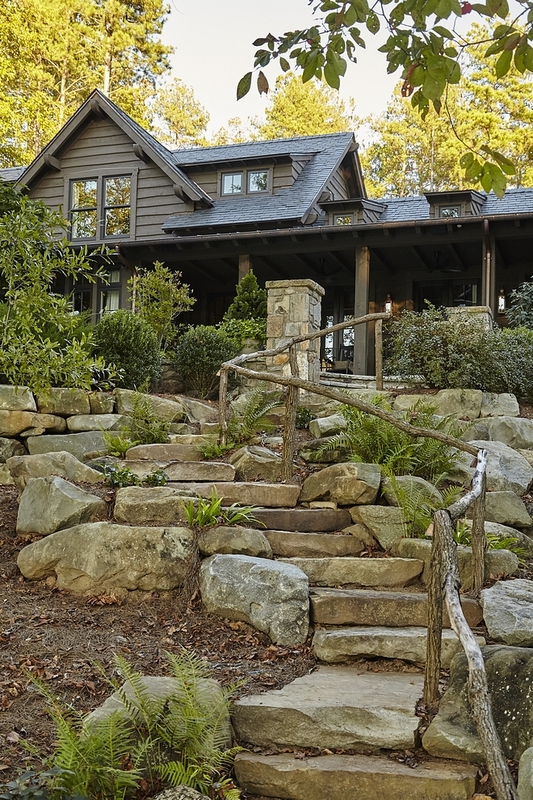 I am loving this stone paver stairway with rustic wood railing. This is a great a idea for sloping lots. 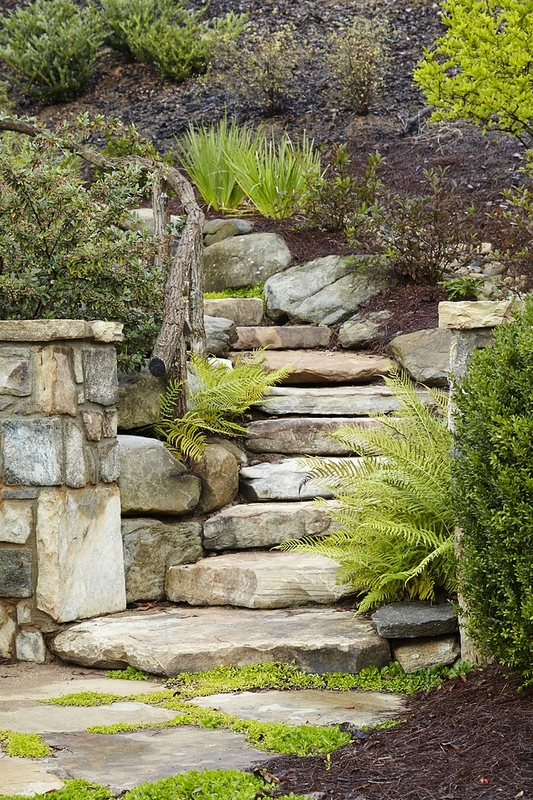 Steps are made of natural Weathered Granite. Many thanks to the project manager, architects and interior designer for sharing the details above.